Idar-Oberstein, Germany – The new Universal Cutting Mills from Fritsch are suitable for reducing the size a wide range of different materials due to variable adjustment of the rotational speed of the rotor, various knife geometries, replaceable blades, practical sieve cassettes and that with a reamarkable ease of cleaning. Universal Cutting Mill Pulverisette 19 with variable rotational speed adjustment. 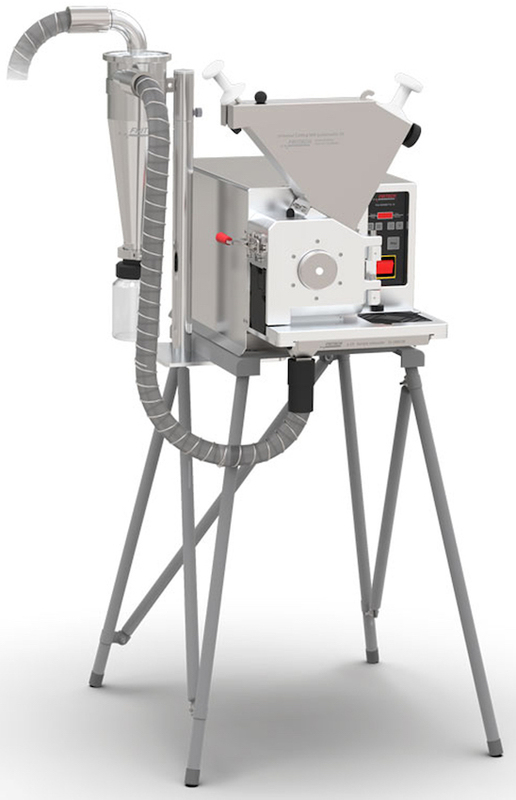 The high-speed Universal Cutting Mill Pulverisette 19 comminutes up to 60 l/h of soft to medium-hard sample materials and fibrous materials at a torque of up to 30 Nm with reliable reproducible results. A special advantage of the machine is the variable rotational speed adjustment in increments of hundred between 300 and 3000 rpm, which enables fine tuning of the comminution process for each sample within a very wide range of applications. The low-speed Universal Cutting Mill Pulverisette 19 features variable rotational speed adjustment between 50-700 rpm and a torque of up to 67 Nm. Due to the combination of low cutting rate and extreme cutting forces, this enables a very powerful comminution of hard, tough-elastic samples and small sample quantities. At the same time, it is the ideal solution for all applications where e.g. thermal damage, the loss of highly volatile substances, or an excessively high fine share need to be avoided. For a clean, convenient, and cool sample extraction, the Pulverisette 19 can be combined with a Fritsch cyclone separator and an exhaust system. The strong airflow ensures simple feeding, increases throughput, reduces the thermal load of the samples and enables the use of finer sieve cassettes to achieve a higher final fineness – even for materials, which are otherwise difficult to comminute finely. Pulversiette 19 with new Fritsch high-performance cyclone separator. The Fritsch high-performance cyclone separator, made of stainless steel 304, is particularly indispensable in the analytical sector and in the food and pharmaceutical industries, and for the processing of heterogeneous mixtures of material, e. g. in the cement industry. Due to its high surface quality, it offers enhanced resistance to corrosive media such as alkalis and acids and is especially easy to clean with a wide range of possible cleaning agents, without leaving any residues. In addition, it can be completely dismantled, fully emptied, flooded and sterilised, and thus offers reliable protection against cross-contamination. Especially convenient: The comminuted sample is drawn directly into the screwed-on sample glass or in a larger collecting vessel of up 60 litres, in which it can also be transported and stored. 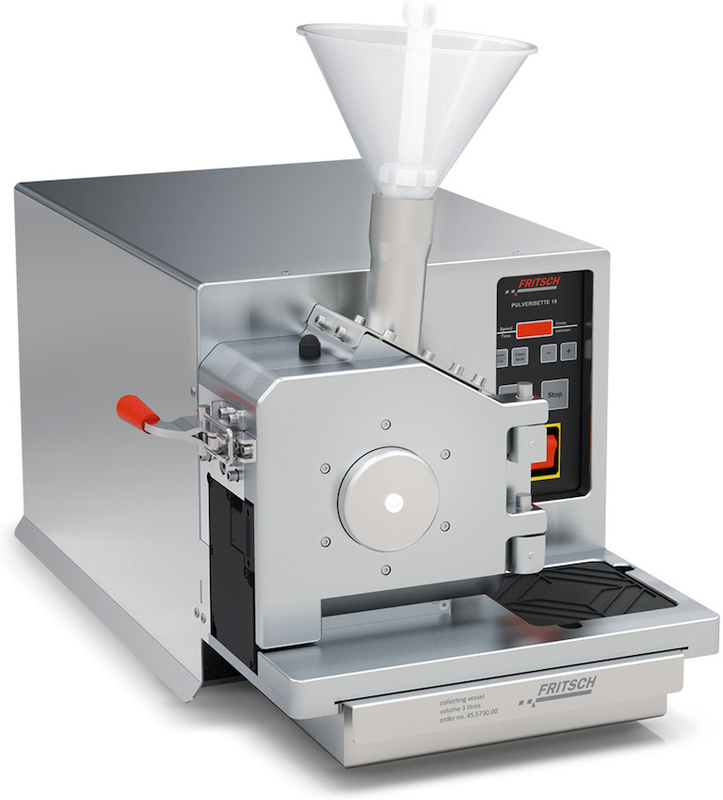 Especially for exhaustion of small sample quantities, Fritsch designed the compact small volume cyclone separator. It is made of plastic, can be dismantled completely and cleaned in a dishwasher for reliably preventing contaminations. The comminuted sample is collected in a screwed-on sample glass of 250 or 500 ml volume.